On quick notice, I grabbed my microphone and headed from our booth in Turn 3 across the track to the front stretch where the super late model drivers were signing autographs. Live broadcasting is always an adrenaline rush, but I loved simultaneously describing the scene for the fans listening in and panting as I speed-walked to the scene. Situations like this require quick thinking and improvisation on the spot, and with every broadcast, my skills get sharper! I even got to interview former NASCAR Nationwide Series driver Johanna Long as fans lined up to get a picture with her in front of the Eagle Jet International car she was driving that night. Shortly after that, we had to call it a night on the broadcast side of things. Still, the team stuck around to watch the headline race, which had no shortage of drama. 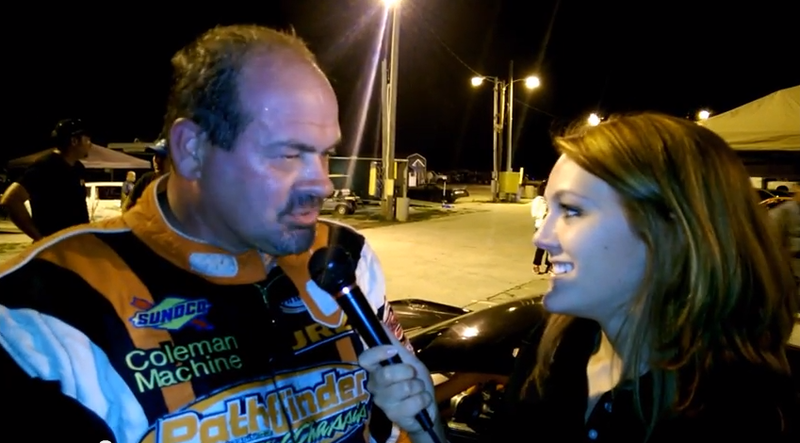 Wayne Anderson took home the checkered flag after leading most of the night, and I caught up with him after the race for this interview. I also was able to stop second place finisher Herb Neumann Jr. at the scales to ask him about the drama he and Randy Anderson were involved in on the track. At the end of the night, good things still came out of disappointing times! We kept plugging and were able to grab some valuable interviews on a night most would have given up on. And of course, I have to thank my trusty cameraman Matt Nix for the help! The crew is looking forward to getting things back on track (pun intended) for this Saturday’s race broadcast at Volusia. We’ll be live on air at 7:30pm and online at floridasportstalk.fm – we hope you tune in and join us! These videos originally appeared on my blog for Florida Sports Talk Radio.